DEFCEE, BILLY WOODS, TOMORROW KINGS, PREM ROCK, DJ MO NIKLZ! 9/29! @THE BURLINGTON BAR, CHICAGO! Defcee https://soundcloud.com/defcee Tomorrow Kings https://tomorrowkings.bandcamp.com/ Billy Woods https://soundcloud.com/backwoodzstudioz PremRock https://soundcloud.com/premrock DJ Mo Niklz https://moniklz.bandcamp.com/ A show you don't want to miss. @The Burlington (3425 W. Fullerton/Chicago) 21+ $10 Doors @ 8PM If you possess discriminating tastes in music, we'll see you there. If you don't, well... 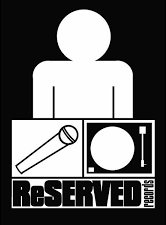 ReSERVED Records http://www.reservedrec.com "We don't do normal...anymore." LAST ANGRY MEN TOUR (featuring Uncommon Nasa & SKECH185)! 8/13-8/22! Uncommon Nasa & Skech185 invade the Midwest, US in August! Check all of our shows FB pages below! 8/13 Chicago, IL @ North Bar w Jyroscope Crew & Defcee https://www.facebook.com/events/803709653061552/ 8/14 Milwaukee, WI @ Cactus Club with Taiyamo Denku https://www.facebook.com/events/919863671407180/ 8/15 Eau Claire, WI @ House of Rock https://www.facebook.com/events/375530989323692/ 8/16 Saint Paul, MN @ 33rd … Continue reading LAST ANGRY MEN TOUR (featuring Uncommon Nasa & SKECH185)! 8/13-8/22!